Discover out-of-the-way places like Cooking Masala and Kayaking & Canoeing. Step out of the city life by going to Vashishta Gufa and Neer Garh Waterfall, Rishikesh. Go for a jaunt from Rishikesh to Narendranagar to see Kunjapuri Temple about 56 minutes away. 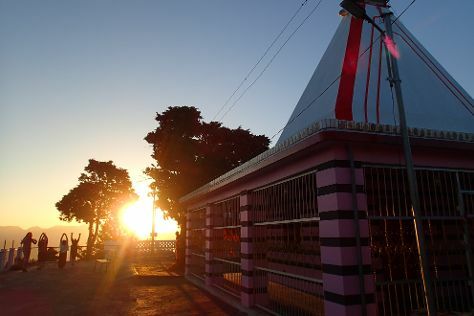 There's still lots to do: take in the spiritual surroundings of Kunjapuri Devi Temple. To find ratings, reviews, maps, and other tourist information, use the Rishikesh planning tool . Ahmedabad to Rishikesh is an approximately 4-hour combination of flight and taxi. You can also do a combination of bus, flight, and taxi; or drive. Cap off your sightseeing on the 12th (Tue) early enough to travel to Joshimath. Jyotirmath, also known as Joshimath is a city and a municipal board in Chamoli District in the Indian state of Uttarakhand. On the 13th (Wed), explore the wealth of natural beauty at Valley of flowers - Hemkunt Sahib. On the next day, appreciate the views at Vanshinarayan Kalpeshwar, take in the dramatic natural features at Gorson Bugyal, and then take in the natural beauty of Tapovan Hot Springs. Find out how to plan Joshimath trip without stress by asking Inspirock to help create an itinerary. You can drive from Rishikesh to Joshimath in 8.5 hours. Wrap up your sightseeing on the 14th (Thu) to allow time to travel to Dhanaulti. Kick off your visit on the 15th (Fri): tour the pleasant surroundings at Eco Park, contemplate in the serene atmosphere at Surkhanda Devi Temple, and then whizz through the canopy at some of the top local zipline courses and adventure parks. For photos, more things to do, traveler tips, and tourist information, use the Dhanaulti vacation planner. Traveling by car from Joshimath to Dhanaulti takes 11.5 hours. Finish your sightseeing early on the 15th (Fri) so you can travel to Mussoorie. On the 16th (Sat), contemplate in the serene atmosphere at Tibetan Buddhist Temple, then relax and rejuvenate at some of the top local wellness centers, then stop by Himalayan Weavers, and finally delve into the lush surroundings at Jabarkhet Wildlife Reserve. Here are some ideas for day two: get outside with SKY WALK Dhanaulti and then buy something for everyone on your list at Pacific Mall. To find maps, photos, traveler tips, and tourist information, refer to the Mussoorie online holiday planner . Getting from Dhanaulti to Mussoorie by car takes about 1.5 hours. Wrap up your sightseeing on the 17th (Sun) early enough to travel back home.